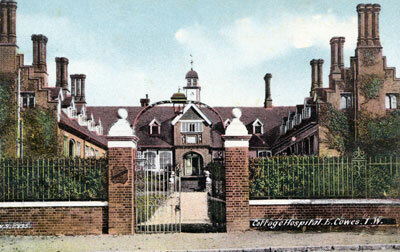 The Frank James Memorial Home, East Cowes, was opened in about 1893 as a home for aged and disabled seamen and their wives. It was built by Arthur and William James in memory of their brother Frank James who had been tragically killed in 1890 by a wounded elephant in West Africa. The brothers were the sons of a wealthy Liverpool merchant, Frank kept his yacht, Lancashire Witch, at Cowes. In 1899, the occupants were given pensions and accommodation elsewhere so that the property could be taken over as a convalescent home for soldiers from the Boar War. When that need had been satisfied, Princess Beatrice suggested that the property could fulfil the need for a local hospital. The two brothers agreed to this suggestion and Frank James Hospital opened in 1903. Over the years, a large amount of the funding came from the local community, especially the employees of J Samuel White & Co.
By 2002 the hospital had been closed and the property (Grade 2) sold off by the Isle of Wight NHS Trust.